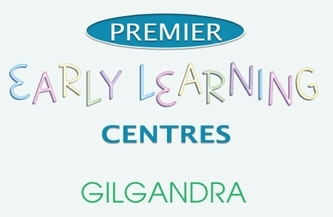 Gilgandra is located in the central west of New South Wales approximately 45 minutes north of the regional centre of Dubbo. 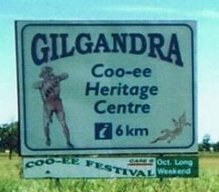 Gilgandra has a population of 2700 people with 4700 living in the district.Gilgandra is known as the town of Windmills and Home of the Coo-ees. Until 1966 the town did not have a central water supply and most people in the town had a windmill. At one point the skyline of the township was dominated with approximately 360 Windmills. 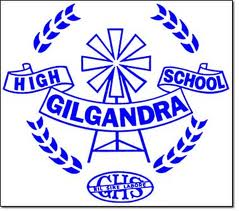 The strength of Gilgandra is the people. The community has services that you would not expect to find in a community of 2700 people. This is largely due to the great community spirit, pride and participation that make it a great place to live, work and enjoy a relaxed country lifestyle but with the advantage of being close to a major regional centre. Local Hearing Support Teacher of the Deaf, Natalie Thurston, sees first hand the difference poor hearing makes to a child's health and development. This passion has driven her to nominate Gilgandra to be part of the Ear Bus Project and she has committed herself to be the local Coordinator. Gilgandra officially joined the project in March 2014 and she has teachers from all schools on the committee. To start things off in Gilgandra Natalie asked the Dubbo Committee to come to the Medicare Local Closing the Gap Day in March to set up a display. 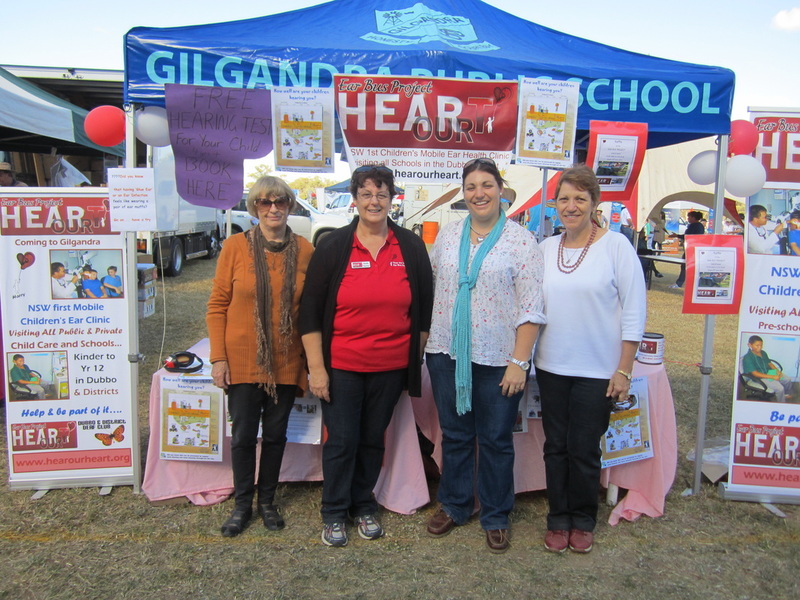 Sue and Gini from the Dubbo Committee went over to talk to locals about how our project will make a big difference to the kids in Gilgandra. News flash. Gilgandra mayor Doug Batton called to let us know we are to receive a grant from Southern Phones for $20 000. Thank you Doug for believing in our project and supporting us. That's just pushed us well over $200 000. Going to be a big year with many of our applications etc all coming to fruition. A load of wood was donated by local man Jay Thurston to raise money for us. All Schools/Child Care Centres worked together to raise a massive $612.65 in raffle tickets. The raffle was drawn at the Premier Centre on 30/6/2014 by Melissa Watt and Emma Murphy and the winner was Lorraine Luff. Thankyou to everyone for helping to sell the tickets. Thankyou to Janine Hazelton, Brenda Purvis and Diane Irving for helping to sell tickets at IGA. Thank you to the Premier Centre, St Josephs, Primary School, High School, Preschool, IGA and those who sold tickets at Gil Show. We really want this Ear Bus to come to Gilgandra. 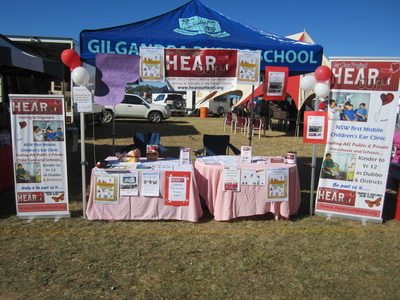 Another case of ....."Small towns making a BIG DIFFERENCE"
In June, at the Gilgandra show, the team set up a fantastic display to start their education campaign. 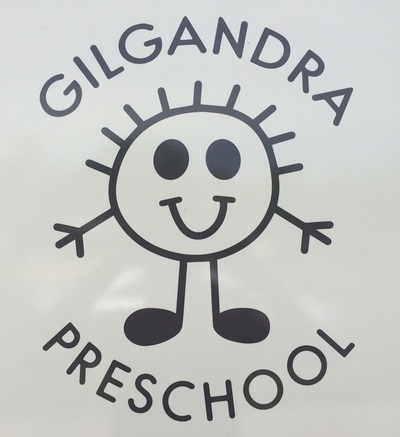 The aim of this campaign is to teach Gilgandra exactly what the Ear Bus Project will do for Gilgandra and take ideas on how things could work better for the project in their community. 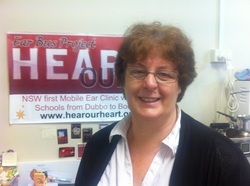 Margot Piggot sat and took names for free hearing tests while the dedicated Committee were busy handing out Hear our Heart Brochures. They also sold raffle tickets for the trailer load of wood on the day.